So you want to design your own custom t-shirts and you want to keep them cost effective. If you follow these key points about how we price custom t-shirts it will help you in designing cost effective t-shirts. 4 Things play a part in the ultimate price you pay for your custom t-shirts. 100% preshrunk cotton t-shirts will be the least expensive shirts. White t-shirts are also less expensive than colored tshirts and grays fall in the middle. Performance Poly like your dri-fit materials and poly cotton and triblend shirts are more expensive. Camo and tie-dye tshirts are your most expensive. 2. Printing (Print location and colors) Is the design a 1 color design or an 8 color deisgn or any number in between. The less print colors the less costly the shirt. Print location, one location is less expensive than multiple locations. So a shirt with a print on the only the front is less expensive than a shirt with a print on the front & back or front, black, and sleeves. 3. Quantity: How many shirts will you need to order. The more shirts the less costly each shirt becomes. Where a 12 shirt order with a particular design might be in the $9-$10 range per shirt, that same design on 50 shirts would closer to the $8 per shirt range. 4. Print Colors: The rule to keep in mind to get the most cost effective shirts is dark ink colors on lighter shirts is less expensive than light ink colors on darker shirts. Light ink on dark shirts often demands an under base or multiple hits on the ink to gain the correct opacity. In the graphic above you have the same design printed in 4 different ways. A single color print on a white shirt being the least expensive and a 7 color design on a black shirt being the most costly and then 2 examples of a print that will fall in the middle. One thing to keep in mind is a high nummber of print colors should equal a high quantity of shirts. You don’t want to get an 8 color design print on 24 shirts. It’s completely cost prohibitive. Each print color commands a $15 screen charge. So a one color print will have a $15 screen charge. An 8 color print will have $120 in screen charges. Ideally when you divide the screen charges by the number of shirts you want to order you are looking to keep the cost per shirt when divided by the screen charges as low as possible. 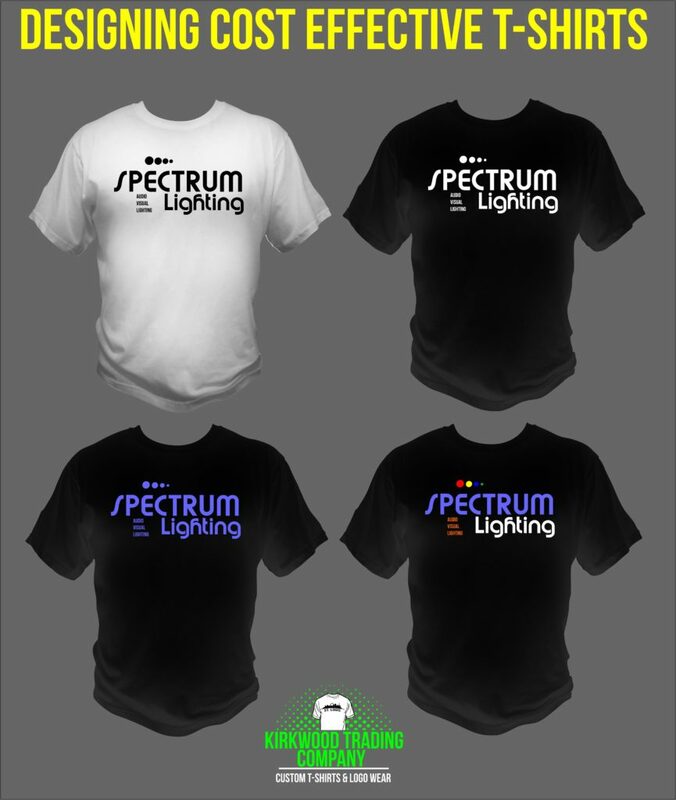 Example: 100 white t-shirts with a 1 color front print is going to run around $6/shirt with a $15 screen charge. If you divide that $15 by 100 shirts you get $.15 cents. So of the $6 shirt cost, $.15 cents of that $6 is going toward the scren charges. Now take $120 worth of screen charges and divide that by 50 t-shirts. 50 shirts with an 8 color design would run say $10.00. If you divid $120 by the 50 shirts you get $2.40. So that would be considered a high number. The lower you can keep the screen costs effecting your per shirt cost then that is how what designing cost effective custom t-shirts is all about. Remember, small quantities should have low print colors and high print colors should be reserved for larger quantities of shirts.